It is a rainy gloomy day here in Ohio and of course that tells me to go to my knitting room and get happy. I was tired of working on a baby jacket so I decided to do a quick project and I love the way it turned out. And….I guessed at the number of stitches and rows to use. I was in the store the other day and I saw a young girl with a small purse that her hand went through the opening and she held the cord. It did not hang down much where she was holding the cord. So off I go to try something. I was shooting for a little smaller so it was just a little bigger than a cell phone but I like this size. It is 8 inches wide and 8 inches high. 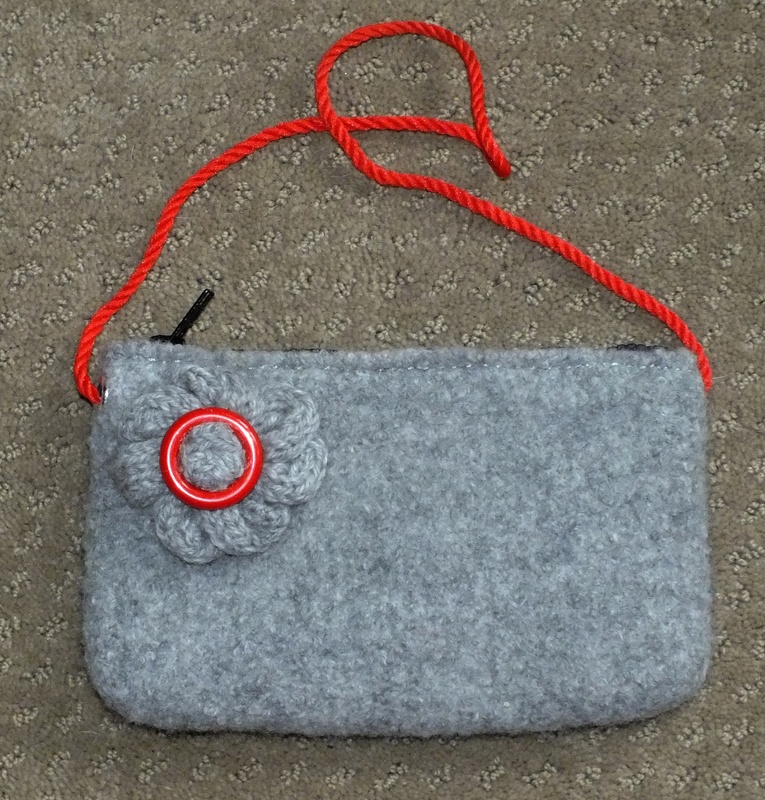 There is a small loop on the front part of the purse and a longer loop on the back of the purse. The long loop goes through the small loop for closure. 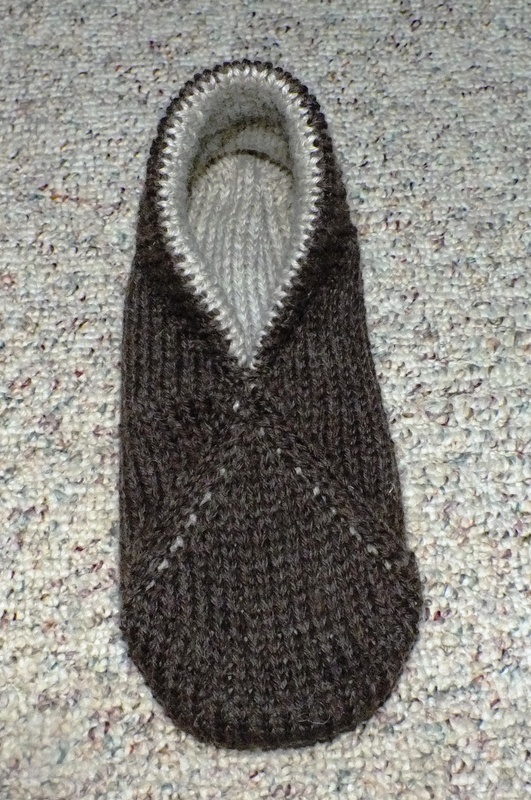 I used Paton’s wool yarn. It takes a whole ball. The second color is called Pelt Pelt Red Fox. I used the Bulky Brother Machine. I used 36 stitches and 62 rows. 20 rows are the top fairisle design. 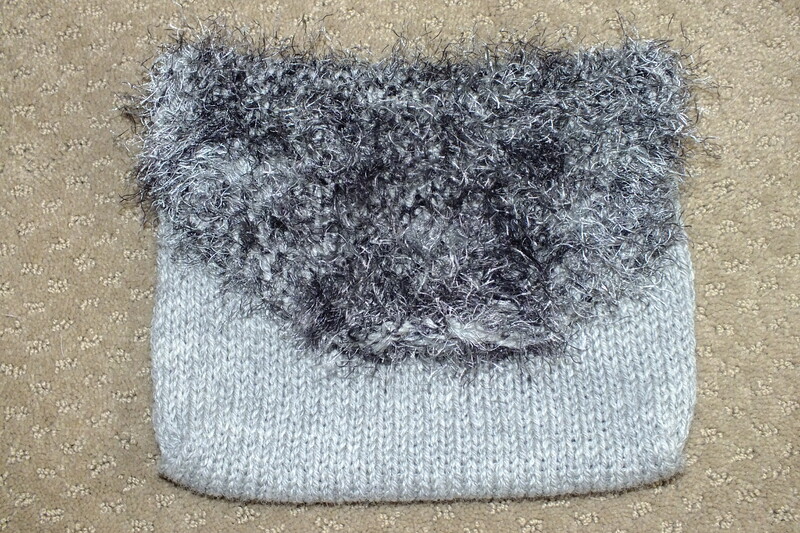 At first I just knitted the wool with the fun fur but it was too bulky and could not see if the stitches knitted off. So I did a fairisle design that is every other stitch on first row and every other opposite stitch on the next row. Brother I believe has a punch card for this. I entered it electronically on mine using four stitches and two rows. Took two seconds to do that. The fun fur really shines and is so silky looking . It has black and the red in it. Hard to capture in a picture. 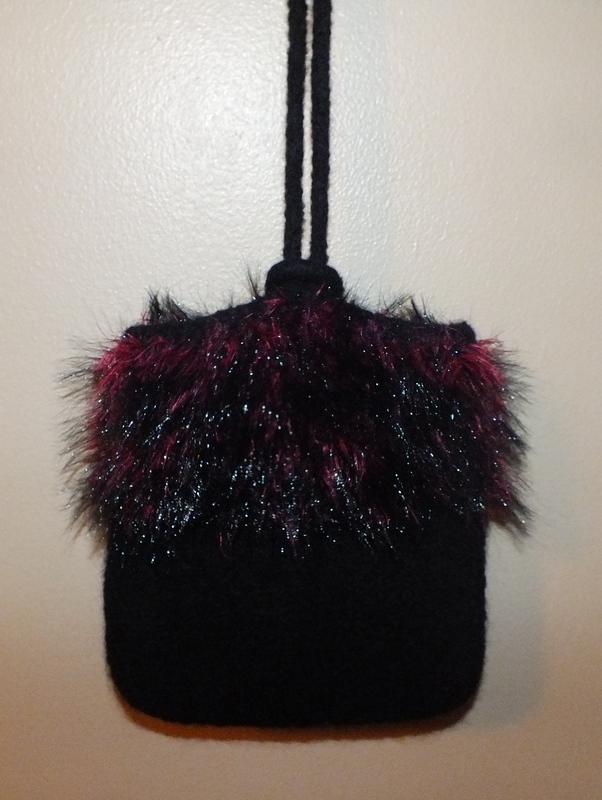 The fun fur is called Pelt by Lion Brand and the color is Red Fox. Here is the pattern I wrote up if you would like to try it. This purse looks elegant if you saw it here. It can also be cutesy with all the different yarns out there. This pattern is not to be used for machine production or sold as your pattern. I was winding all the leftover wool yarn I had to put into a bin. 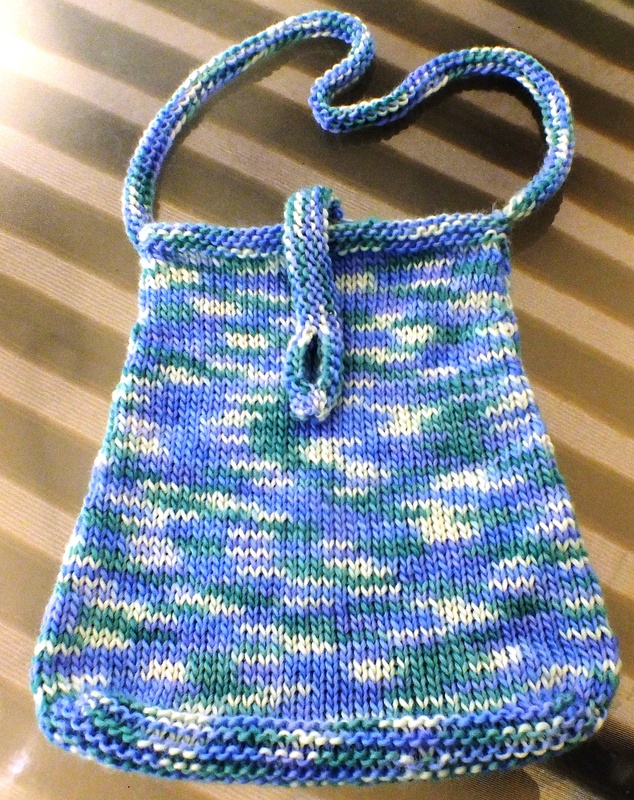 I decided to make the same purse as the last and use up the leftover yarns. I knitted this with the design running all in the same direction so I could use the garter bar totally. 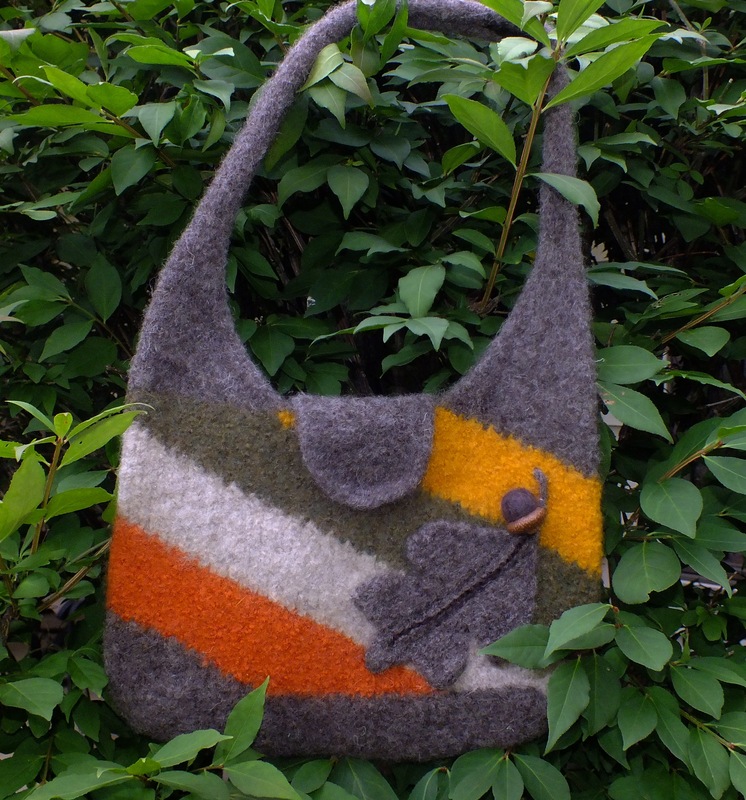 This purse felted beautifully and the shape is perfect . But…..I am disappointed and I should have known better . I used gold, olive green and cranberry. The olive green does not show well on the darker brown on the bottom or the heather brown that is the middle color. I am so glad that I was using my left overs and did not make a special trip to buy the yarn. I will have to chalk this up as a learning experience. I even found oval rings for the handle. AND.. I put the design on the back also. I do suppose I could needle felt a brighter green over it…..nah! I did write the directions down if anyone just wants to try the purse to felt . You can leave the rings off and the design off if you want to just try it. Make sure you have at least 7 ounces of yarn. I actually would have been better off just doing stripes with all my leftovers. That would have been colorful. 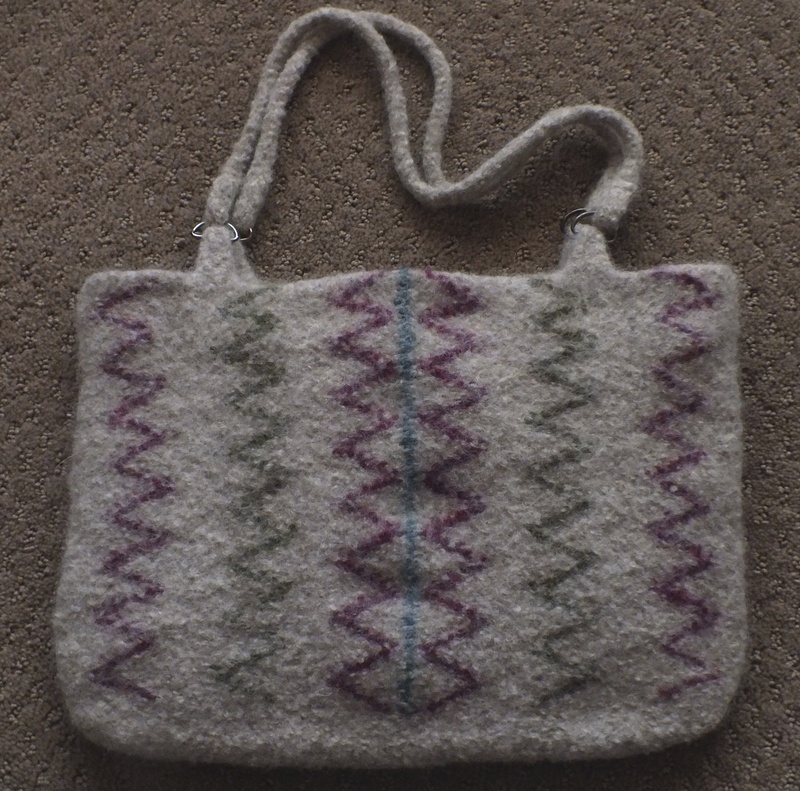 In my drop box I have the picture of the purse, the document with the instructions and a sheet showing the graph with the increases at the beginning and the decreases as you knit up. 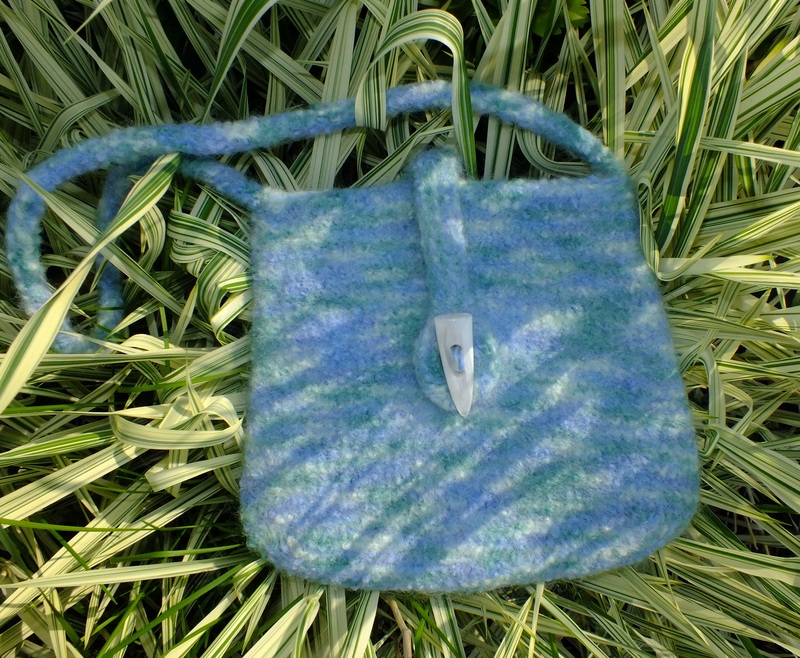 The blue color on the side of the design is the six stitches that are added and then decreased. 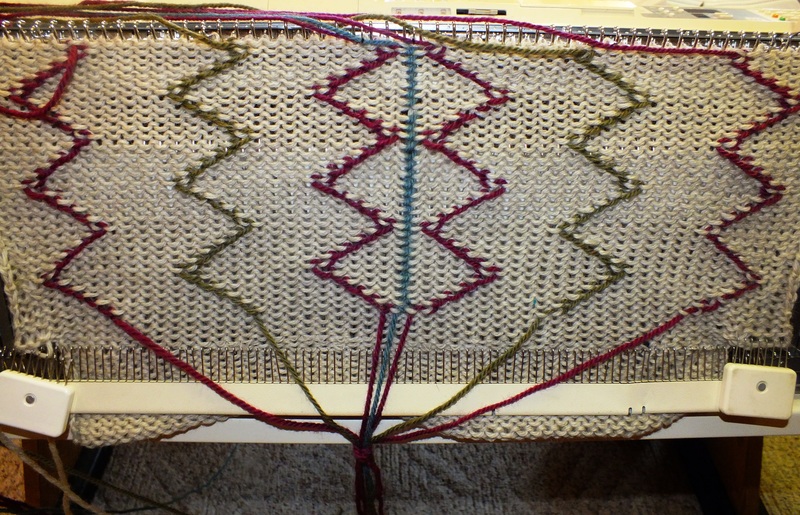 I wanted to use the garter bar to do some vertical weaving. I have known about this technique for a long time but never tried it. 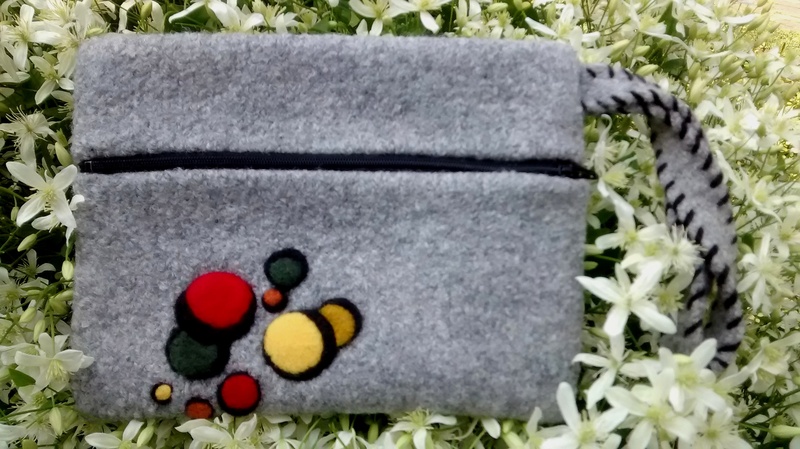 I decided to use it for a design on a felted purse. 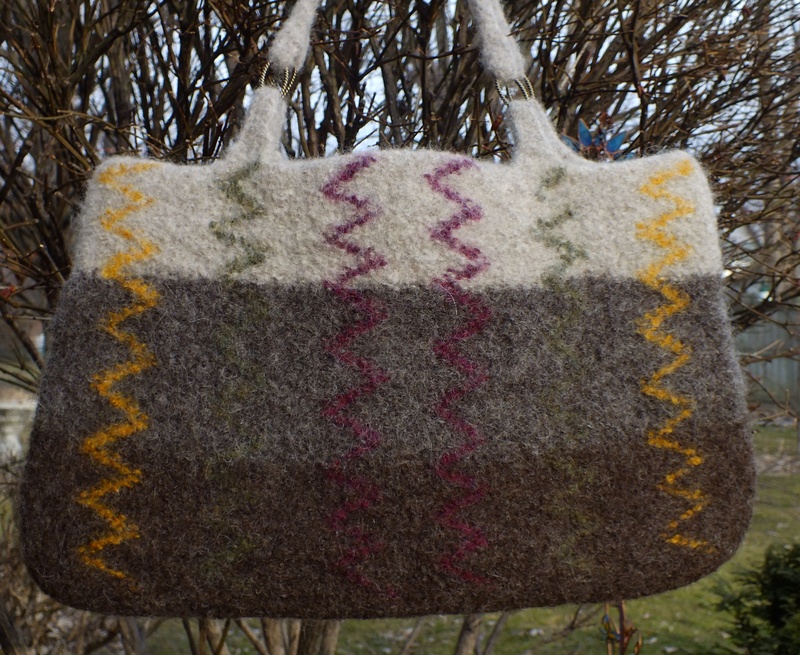 I started the bottom of the purse but ran into problems when the weaving went back and forth. I also wanted an uneven number of vertical weaves to add the one blue color. So I went into win/crea and came up with this design . When I started to knit and do the weaving I ran into a problem with wrapping the vertical yarns. Because my zig zags were going in opposite directions I had to wrap 4 in one direction and 3 in another. I always wrapped the middle color the same direction since it was going straight up. I have never used the purl side for felting but I had to since the design comes out on the purl side. 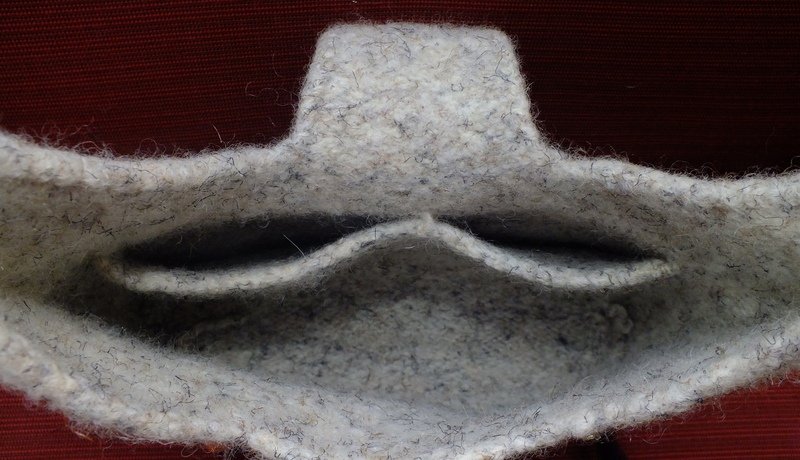 The sewing up of the side seams was really easy and almost invisible before felting. I call this my coffin purse. I am sure you remember hearing sweaters described that way. Only the front shows when you are in a coffin. Well, I did not want to put the work into the back since this was the first time felting using the purl side. 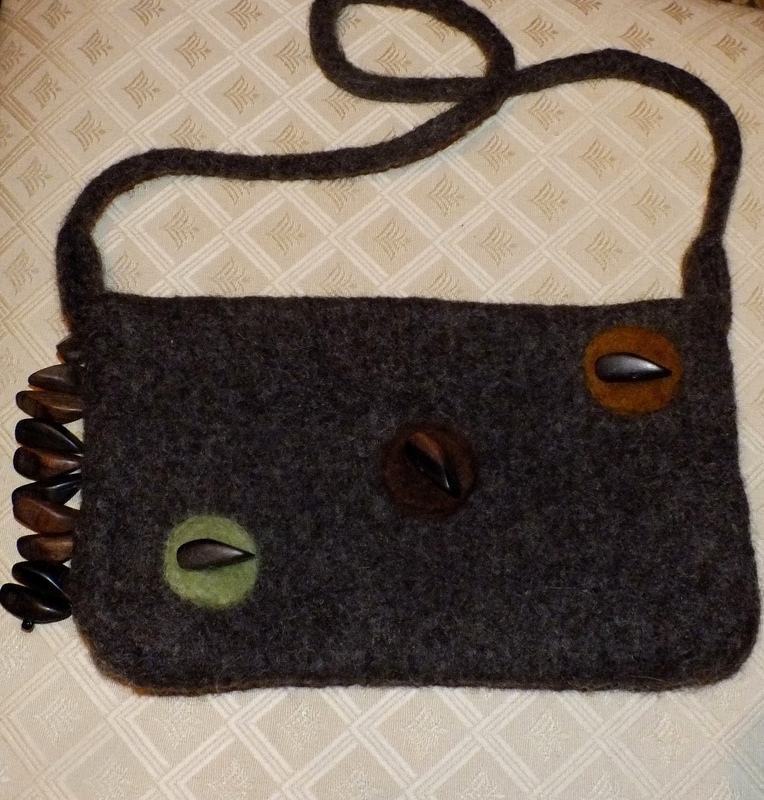 The purse was 17 inches long and 14 inches wide before felting and I was worried it would come out too long. After felting the size was 10 in length and 13 in width. I was amazed on the shrinkage of the length. And it turns out that I could have done the back with the weaving. I have an electronic brother and I programmed the pattern into the machine and used the KC button. This selected the needles for wrapping and made it easy. The idea is to lift the garter bar up with the yarn and then wrap all in the same direction. Since I couldn’t do this I could use the bar to wrap three of them but hand wrapped the others. It did not slow me down much. This last picture shows how I started by tying all the strands together. Once the first row is knitted, it anchors the yarn and then you use the garter bar to lift the yarns up and around the needles all at one time. 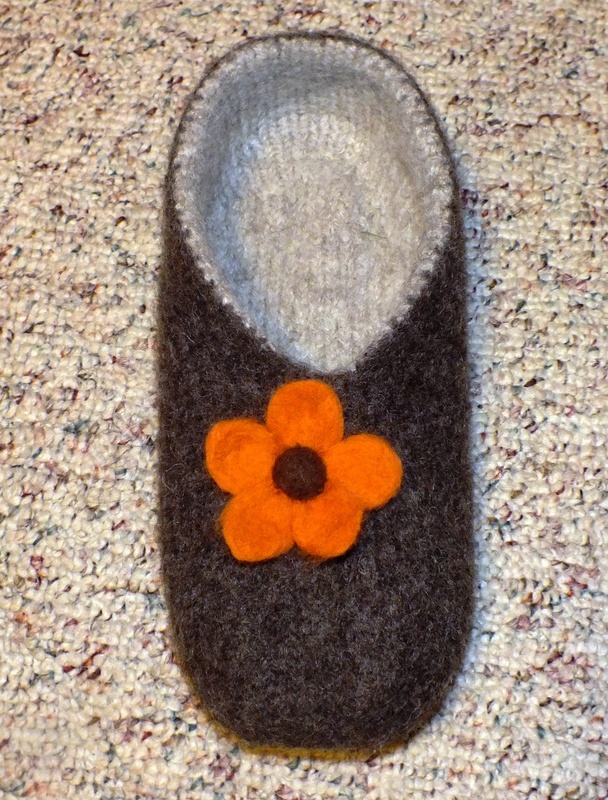 A couple of weeks ago I stumbled onto the cutest mouse pattern by Lorraine Pistorio. The pattern is called Christmas & Hanukkah Mice. 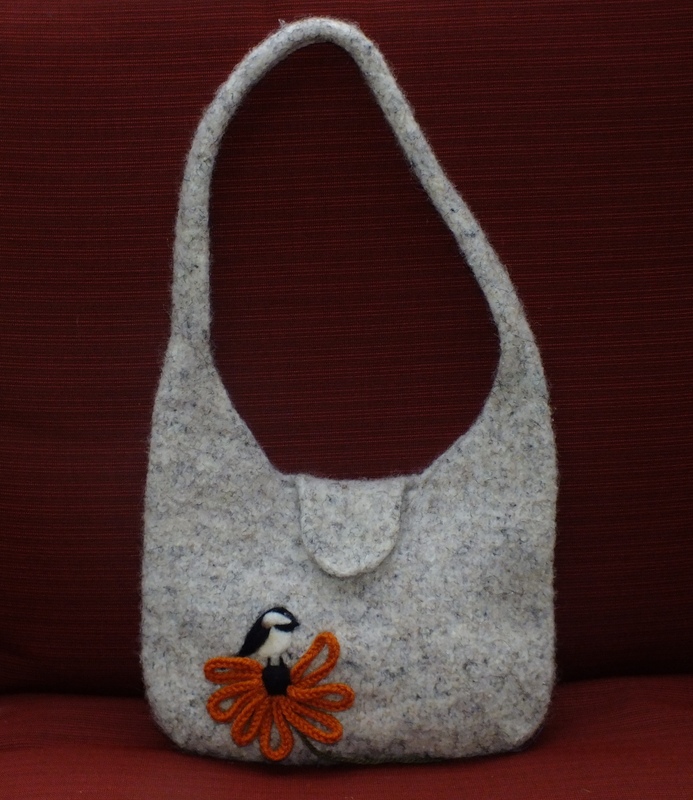 It is a hand knitting pattern but I figured I would try to convert to machine knitting. Great pattern, pictures, and detail! What I found out is that I was able to knit the body on the machine after hand knitting to row 12. I was able to knit the arms on the machine. The head I was able to do after row 10 and the ears after a couple of rows. The feet had to be done by hand. The time it took on the machine was about 3 hours whereas by hand was about 2 days of knitting off and on. The first one I made by hand, I overstuffed and it would not felt down well. So, the second one that I made, I lightly stuffed so the piece would not felt together. I left an opening in the body, head and feet to add stuffing afterwards and this is what I have. I knitted a little scarf and felted it. I even felted the candy cane. He is supposed to have a Christmas Santa hat but I love his ears so much I hate to cover one! I may needle felt the inside of his ears with a light pink. 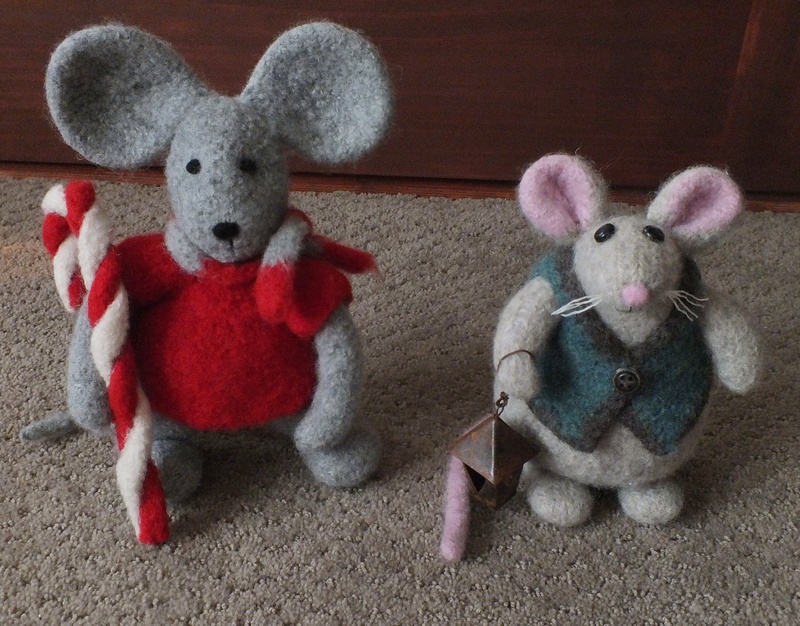 The other felted mouse is the one made from the MKN pattern insert and it is in machine knitting instructions.